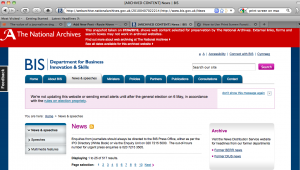 Today I tried to dig out a few press releases from the Department for Business, Innovation and Skills website dating back to Peter Mandelson’s tenure as business secretary. I was a little surprised to find that any press releases dating from before the last election had been archived. Would it be harsh to accuse the government of hiding information about its predecessor’s work? Possibly. Though it’s worth remembering that Vince Cable once famously declared that Gordon Brown had gone from Josef Stalin to Mr Bean. From this bout of historical revisionism one could accuse his department of having tendencies towards the former. The Treasury website was purged within a few weeks of the election as well. Thanks for the comments guys. For a government that prides itself in being open, it’s a shame it is making it difficult for people to read about the policies of its predecessor. It’s I don’t object to archiving this stuff on a different site but it should remain easily accessible to the public. It may not been the worst thing they’ve done, but it contradicts their moves to promote open government. You may be right Adam – the various DWP IT debacles under the last government spring to mind. If that’s the case, let’s hope that this government put things right sooner rather than later. On the other hand, large IT projects that run into problems aren’t designed from the outset to fail, are they. This is not a large project and involves no change in technology. Applying Occam’s Razor reveals deliberate weeding as the most likely explanation. As I’ve already pointed out to Rosie – the Tories have form on this. Boris’s much vaunted (crap and delayed) shiny new Mayor of London website did a rather excellent job of deleting everything pre-2008. Never attribute to malice that which is adequately explained by stupidity. Meaning, foulups are always the most likely explanation. I went to the site you mentioned and found archives – it was probably just having a problem when you tried it.